It was revealed this week that Bond 23 is finally on the slate for shooting to begin this year, with a November 2012 release date. The saga of the next Bond film has been going on for some time now. The rocky economic climate has affected many companies around the world, and last July we heard that the next Bond film had apparently been cancelled. MGM had been in turmoil for some time, with financial problems slowing projects, and no sign of a buyer. Things appear to be looking up a little, and a release date for the as yet untitled Bond movie is great news. James Bond is one of very few enduring British characters in recent cinematic history. Bond movies have been made fairly consistently over the last 50 years, and have always allowed a place for British movies in the North American film industry. 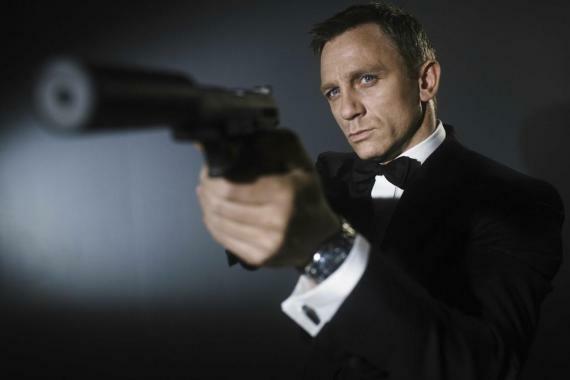 Bond is not only the most iconic British movie character, he is one of the most recognisable action heroes in cinema. He has, however, been absent from our screens for a few years now, allowing a certain Mr H Potter to take over as the most commercially successful British movie character currently active. With the last entry in the Potter series set for release this year though, the stage is now set for Bond to take his rightful place as Britain’s cinematic ambassador. The Bond movies have never really been considered high art, and are more popcorn action mixed with elaborate stories of conspiracy and espionage than they are compelling drama and complex characterisation. There had been an improvement in this recently, with Casino Royale considered by many as the best of the Bond films, taking a very serious and gritty Bourne-like view of the gentleman spy. The news that Academy Award winner Sam Mendes is still attached as director gives hope that the stature of the Bond movies could take another step up. The promise of exciting action being linked up with Mendes’ characteristic emotional storytelling style certainly increased my interest in the next film when his appointment was originally announced, despite the fact that i really have never been a fan of the series. A firm committment to production is also good news for star Daniel Craig. He had appeared in films before Casino Royale, but his appointment as Bond is what has really elevated his status, and the parts he has taken on in-between have not had a great deal of impact. Having Bond in place for 2012 means his profile will maintain that boost that a blockbuster movie provides. Of course, there is no guarantee that the film will be a commercial or critical success. Mendes’ presence gives hope for a great film, but it does not necessarily hold the key to big box office. The talented director’s films are generally quite bleak in nature, and ironically the one film that wasn’t, 2009’s Away We Go, struggled critically and financially.The dark atmosphere of his filmography could put off audiences looking for uncomplicated action. The presence of Craig as lead and the restrictions of the genre and series mean that there is not great scope for Bond 23 to greatly out-gross previous installments. For a continuing series to be viable for a financially unstable company, the next Bond needs to perform exceptionally well at the box office. With Craig’s star power dubious at best, the best chance to draw in a greater audience will be to cast a big star as the villain. The potential pitfall of this is that the series star could be outshone, and a big personality could upset the balance of the storyline. It is a dilemma, and one that Mendes will be staring up at as we speak. Whatever the outcome, it will be good to have such a well loved franchise back on our screens. With the Hobbit project also now moving along at pace following its financial uncertainties, it looks like the financial gloom hanging over the industry is starting to lift. A Sam Mendes Bond film will be the first one that i will have genuinely looked forward to, so i hope it does go ahead as scheduled, without running into further problems. I also hope it lives up to its great potential. The future of a great cinematic institution may just depend on it. This entry was posted in Articles, News and tagged 23, bond, bond 23, box office, british, cancelled, daniel craig, eon, espionage, films, james bond, latest, mgm, movie, movies, news, production, sam mendes, schedule, shooting. Bookmark the permalink.